Italy was the first in the History of Aviation to use the airplane for bombing, during the conquest of Libya in 1911, but after WW1 faced the internal crisis that paved the way for Mussolini's fascism. So, the civilian development of its airlines was delayed for some years. Indeed as one of the major European powers in the 20th century, one might expect that Italy would have made an early start in commercial aviation. On the contrary, Italy was actually one of the last in Europe to begin civil aviation services, despite considerable experience in military and naval aviation before 1920. Political instability was the main factor, but geography also played a part in Italy's late start since the Alps and the Apennines prevented regular civil air travel within Italy. Not until the mid-1920s, a good five years after the rest of the major European powers, did Italy become a major participant in European commercial aviation. Like many other European nations did in their early phases of civil aviation, Italy initially formed several small companies that struggled to provide a modest level of passenger service. The first of these was the "Aero Expresso Italiana" (AEI), founded on December 12, 1923, which began offering services in August 1926: the first flight was from Torino to Trieste with a seaplane Cant 10 with 10 passengers. By 1930, there were five other Italian airlines, including the "Società Italiana Servizi"(SISA), the "Società Area Navigazione Aerea" (SANA), the "Società Area Mediterranea" (SAM), and the "Società Area Avio-Linee Italiane" (ALI). Almost all of these early Italian air services were state-owned or state supported. The only major exception was the ALI, which was backed by the powerful Fiat industrial empire, a builder of automobiles. The three biggest airlines, SISA, SANA, and SAM, equally split the Italian civil aviation market, carrying about 10,000 passengers per year by 1930. If in 1925 it seemed like Italians hardly had a civil aviation sector, by 1930 they had made rapid progress. In fact, Italian commercial aviation in 1930 was third in terms of the number of passengers carried, after Germany and France, and ahead of Great Britain and the Netherlands. Most Italian routes were limited to locations geographically close to the country and flying to Germany, the Italian territories in north Africa (particularly Libya), Greece, Turkey, France, and Austria. The "SA Navigazione Aerea" (SANA) first air service to open was from Genova to Roma, Napoli and Palermo on the island of Sicilia (Sicily) on 20 August, 1925. On 7 April, 1926 SANA started a second civil air service of Italy: Genova – Napoli - Palermo. The 1,070 km long service was operated three times weekly (Monday, Wednesday and Friday) with return on Tuesday, Thursday and Saturday. The 1930s was a time of consolidation for the European aviation industry, and Italy was no exception. In August 1934 SAM, SANA, and SISA combined to form a single national carrier known as "Ala Littoria", which was owned by the government. The creation of "Ala Littoria" was largely motivated more by political changes in Europe than by commercial interests: Benito Mussolini's fascist party had gained power in Italy, and the new government was eager to display the Italian flag as a symbol of the country's new prestige. Mussolini's conquest of Albania and Ethiopia in Africa (called Abyssinia by some historians) was aided by the Ala Littoria airline, which helped maintain transportation routes between Rome and the hinterlands. One company, ALI, remained independent of government control and maintained its operations, mostly to Nazi Germany-an Italian ally- with the strong support of the Fiat company. Italy used planes in the 1920s much like those used by other European countries at the time: a mix of mostly German (the Junkers G-24 and F.13 and Dornier's Wal and Super-Wal) and Dutch (Fokker F.7b) aircraft. The SAM company also used a fleet of Caproni and Savoia-Marchetti flying-boats. After nationalization of the Italian airlines and the formation of "Ala Littoria", the Italians began to use planes designed and built by Italians. These were mostly bombers converted for civilian use such as the three-engine Savoia-Marchetti S.73 monoplane. In order to study in detail the main first commercial airline of Italy, we have to pinpoint that Ala Littoria was incorporated in 1934, with the aim of making it Italy’s main national airline. The airline was formed as a result of the merger of SAM, SANA,and AEI. In addition, in 1935, Albania’s "Societa Adria-Aero Lloyd" and "Nord Africa Aviazione"(NAA, an air-line operating in Lybia) were absorbed by Ala Littoria. Umberto Klinger, previously a director of SAM, was appointed chief executive of Ala Littoria at the end of 1934; his huge experience in civil aviation and airline management was a key factor in his selection. By the end of 1935, the only private airline that remained in operation in Italy was ALI, owned by the FIAT industrial group. Ala Littoria’s inherited route network was extensive and ranged throughout Europe and Italy’s African colonies. It was at the time of the war in Ethiopia that fascist “colonial aviation” came into being, as a result of consolidation in the domestic aviation market and the need for air links both to and within Italy’s overseas colonies. Ala Littoria’s equipment included three-engine air-craft for domestic and European links and four-engine craft for the longer international routes. Its ﬂeet included seaplanes for access to coastal and lakeside airports. At its height in late 1939, Ala Littoria ﬂew to thirty-eight airports in every European country and in Italy’s African colonies, with a ﬂeet of 132 aircraft. From 1938, connections had also been established with South America with a route to Buenos Aires. It was also proposed a route to North America and India/Japan in the 1940s, but war stopped it. Passenger numbers reached 50,000 per year by the start of World War II, with more than 3,570,905 kilometers ﬂown per annum. Ala Littoria’s development from 1934 through 1940 made the Italian civil aviation market the ﬁfth most developed in the world by 1940, after the United States, the Soviet Union, Germany and Great Britain. Furthermore, from the establishment of Italian East Africa in 1936 onward, the Ministry of Aeronautics and Ala Littoria were active in developing a colonial civil aviation network, connecting Italy’s North and East African colonies with each other and with Italy, while creating internal routes within individual colonies. By 1939, ten airports and one seaplane landing area were used for civil aviation trafﬁc in Italian East Africa alone, a more developed colonial aviation network than in Italy’s other colonies. Libya, for example, featured only four airports and two seaplane landing areas in use by civil aviation trafﬁc in 1939. Reﬂecting Ala Littoria’s key role in maintaining links between Rome and Italy’s colonies, the airline was accorded the lion’s share of facilities and hangar space at these airports, as seen in airport planning maps. Furthermore in 1937, Assab airport in Eritrea was sufﬁciently well established to be able to accommodate Amelia Earhart and her aircraft in her ill-fated round-the-world attempt. Additionally, as has been noted, the airline enjoyed strong political support: it was championed by Italo Balbo (the would-be successor of Mussolini), while Mussolini’s son Bruno was, brieﬂy, one of its managers. While in the late 1920s the Italian commercial flights reached European & Mediterranean countries around the Italian peninsula, in the 1930s there were new routes with long distance flights toward other continents. Indeed the British airline company "Imperial Airways" wanted to operate in the late 1920s a through service from London via France, Italy and Greece to Egypt and India. The Italian government demanded from the British that the "SA Navigazione Aerea" would be able to pool between Genova and Alexandria. When the British refused to agree, they were forced to re-route the air service. The Italian government refused the British to enter Italy via France and thus the route had to be rescheduled and changed into a flight from London to Basel (Switzerland), then to a train ride to Genova (Italy), where passengers, mail and freight were transferred to the Short S.8 Calcutta flying boats for the sea-trip to Alexandria in Egypt. The curious point here was that the Italians allowed the British to leave Italy from an Italian port, but Imperial Airways Ltd was not allowed to cross Italian soil to Genova. Imperial Airways Ltd finally could open its air service on 30 March, 1929. As a countermeasure the Italians started two weeks later a parallel air service. On 15 April, 1929, the SANA opened an air service from Genova to Roma, Napoli, Kerkira, Athenia, Rhodos, Tobruk and Alexandria in the former British protectorate of Egypt (total length of the air service was 2,895 km). Imperial Airways Ltd had to fly from Genova to Roma, Napoli, Corfu, Athens, Suda Bay (Crete), Tobruk and Alexandria. With two airline companies flying to Alexandria, the Italian regarded it as a pool service. In the first (and only) year of operation, the Dornier Superwal of "SA Navigazione Aerea" flew 190,947 km (on 33 return trips), and transported 257 passengers (average of nearly four passengers per trip in an aircraft with nineteen seats), 3,952 kg mail and newspapers and 36,731 kg goods and luggage. The air service had merely a political meaning, as in 1930 it had already been closed down again. The two governments failed to reach an agreement and thus the services had to be discontinued by SANA. The British continued to operate as previous and the public did not care for the extra train ride. In fact, at a later stage the passengers, goods and mail had to travel by train from Paris to Brindisi, from where the Imperial Airways Ltd flying boats transported them to Egypt and beyond. The Italians in the early 1930s discontinued the air service to Alexandria and concentrated on their original network of 1928. Roma – Genova (430 km, 3 hours flying) was operated six times weekly, as well as the air service between Roma, Napoli and Palermo (640 km, 5½ hour flying). In Palermo, "Società Aerea Mediterranea" – SAM, the new state-owned airline company offered a connection to Tunis. The service to France and Spain was divided into two services: Roma – Genova – Marseille (745 km, 7 hours flying) and Genova – Marseille – Barcelona (770 km, 7 hours flying). The first service was operated on Monday, Wednesday and Friday, while latter it was flown on Tuesday, Thursday and Saturday. The train from Roma to Genova and Marseille could travel the distance in 24 hours, so compared with the flying-time of seven hours there was a great improvement. From Genova to Barcelona a train would use 28 hours, a fast steamer 21 hours. Again a flying-time of merely 7 hours was an impressive improvement. The "SA Navigazione Aerea" continued the air service to Tripoli in Italian Libya as well, but the landing was done even at Siracusa only on demand. Jane’s mentioned also a landing at Malta on demand by passengers. "Ala Littoria" played an important role in controlling Italy's colonial empire in north and east Africa. But in establishing routes from Italy to Africa, "Ala Littoria" had to overcome many geographic obstacles. For example, airplanes of the 1930s had great difficulty reaching Asmara, the capital of Eritrea, which is located about 15,000 feet (4,572 meters) above sea level. One of the company's proudest achievements occurred in November 1935, when "Ala Littoria" began full passenger service between Rome and Mogadishu, the capital of Somalia, on the east coast of Africa, thousands of miles from southern Europe. The prestigious route was called "Linea dell'Impero", and the airports connected were those of Rome-Benghazi-Cairo-Kartoum-Asmara-Addis Abeba-Mogadishu. In 1939, attracted by the idea of establishing a direct regular service between Italy and Italian Eastern Africa (Africa Orientale Italiana) bypassing the British colonies/protectorates of Egypt & Sudan, Bruno Mussolini (in the meantime appointed general manager of LATI) and his staff carried out a long technical cruise with their improved Savoia-Marchetti SM.83 to Tripoli and the Kufra Oasis (in southeastern Libya), Asmara, Massaua, Gura and Agordat (Eritrea). The voyage (still partially commercial) proved to be very useful to acknowledge those flight experiences necessary for the future war missions. On June 15, 1940 – only five days after the Italian declaration of war – their Savoia-Marchetti SM.83 "615-1" took off from Guidonia (the air base near Rome) to Asmara, via Benghazi (Cyrenaica, Libya), with six passengers and 100 kilograms of mail onboard, officially starting the ‘special’ air links with the Impero (Empire). It was a full success, that opened a new trans-saharian flight route in Africa between Italian Libia and Eritrea/Ethiopia. So, other six flights (now fully military) were completed in 1940 within the end of June, twelve in July and two in August, carrying on the whole 27 passengers, 406 kgs of luggage, 5753 kgs of mail and 4047 kgs of ammo, medicals and spare parts. 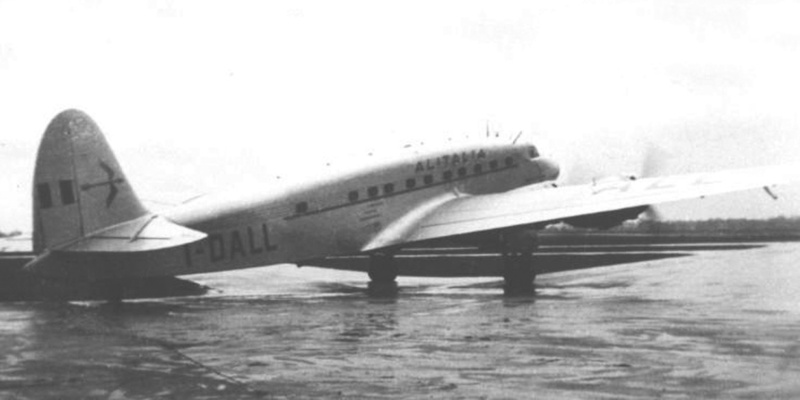 It is noteworthy to pinpoint also that on March 1938 the airline "Ala Littoria" did the first record flight from Rome to Argentina with the route Roma-Cagliari-Bathurst/Gambia-Bahia-Rio de Janeiro-Buenos Aires, using a special hydroplane of the model Cant Z 506, but later the company was substituted by the newly created "Linee Aeree Transcontinetali Italiane" (LATI) for the Latin American flights. LATI was ready to use the best Italian airplane of prewar era, the Piaggio P 108C (that was the civilian version of the state-of-the-art P 108 bomber), but when the airplane was ready in early 1942 the USA entered war and blocked the Italian transatlantic flights. "Ala Littoria" routes in 1940 grew to 37,110 kms, mainly in the Mediterranean and Africa. This accomplishment -as indicated before- made the airline the fifth in the world (after the USA, URSS, Germany and UK's national airlines). Like all other air services in Africa (including those offered by the Belgian airline "Sabena"), the Italian "Ala Littoria" shut down all its operations with the coming of World War II. The Italian company also had to eventually terminate services in Europe as the chaos of the war reached a peak by 1943. With the exception of sporadic operations of the independent ALI, which continued flights between the two Axis powers, Germany and Italy, for most of the war, there was no civilian Italian air service to mention. 1947 Photo of an ex-Italian Air Force type -the Savoia-Marchetti SM.95, a plane that had been at the center of one of Italy’s most audacious wartime efforts: “Operation S” (the bombing of New York City)- with the insignia of "Alitalia"
When Italy resumed commercial aviation operations in the postwar era, there was a burst of civil activity as at least seven companies formed to carry passengers. None of the new companies, however, had any connection with prewar companies such as "Ala Littoria". Major British and American firms, such as "Trans World Airlines" (TWA) and "British European Airways" (BEA) contributed to the restoration of Italian commercial aviation by financing the establishment of two major Italian airlines, "Aerolinee Italiane Internazionali" (Alitalia) and "Linee Aeree Italiane" (LAI). Alitalia expanded rapidly in 1946/1947. New aircraft were added, including another ex-Italian Air Force type, the Savoia-Marchetti SM.95, a plane that had been subject of one of Italy’s most audacious wartime efforts, “Operation S”, the bombing of New York City. Later these two companies (Alitalia & LAI) served as the backbone of Italian civil air activity into the 1950s and eventually merged into a single airline known as "Linee Aeree Italiane" (Alitalia) in September 1957. "Alitalia" remains the airline most commonly associated with modern Italian commercial aviation. 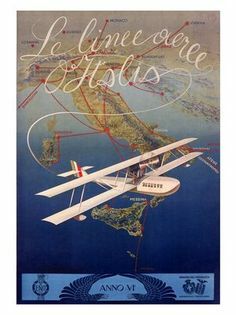 Italy had some international flights in the late 1930s. What about the USA? and Canada?